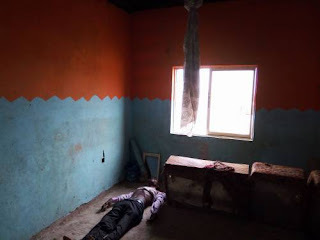 Mr. Benbede Kitchen, a former councilor and father of seven, yesterday killed himself by hanging himself in Yenagoa, the capital of Bayelsa State. The 43-year old former public office holder was said to have been found at about 4am dangling from the ceiling of his room with a bedsheet around his neck. Mr. Kitchen, popularly called G.K. Bekegbo, was said to have left no suicide note, a situation that has made the reason for the suicide hazy. Some sources of Saharareporters in Yenagoa said Mr. Kitchen, a former supervisory councilor at the Health of the Rural Development Authority (RDA) during the administration of the late Chief DSP Alamieyeseigha, slipped into sadness, following an unexplained disappearance from home. He was said to have tried, unsuccessfully, to find the wife, identified as Madam Beauty, whom he suspected of infidelity. This, they said, pushed him into alcoholism. Mr. Benjamin Samuel,his caretaker told newsmen that the deceased walked into his room at about midnight to request a certain phone number. Mr. Samuel said he gave him the phone number and that was the last interaction he had with Mr. Kitchen. “At about 6 am, I heard people crying and a knock on my door. At first, I thought it was armed robbers. I was later led to one of the rooms upstairs, where I saw his lifeless body dangling from the ceiling. I and one of my boys brought his corpse down,” he said. Mr. Samuel added that he was later informed that Mr. Kitchen made many angry calls till well after midnight. He, however, could not place a finger on what exactly could have driven Mr. Kitchen to take his own life. “I am confused and disturbed as to why he chose to kill himself, leaving seven lovely children behind. It is unfortunate,” he said dejectedly.